In Ramadan it is good to have lots of water, fruit juice or beverage. But we love to have oily fried stuffs. That’s why we need to make our beverage interesting and tasty. Lassi / smoothie is an easy simple tasty but healthy recipe. You can make lassi/ smoothie with mango / banana or with your favorite fruit. I gave 2 different recipe one bengali and one in English, reason for that Misti doi (sweet yogurt) is not available in abroad, but typically lassi is made with sweet yogurt. So english version I used greek yogurt and Bengali version I used sweet yogurt . Blend all things together and make it smooth. Serve mango lassi/mango smothie chilled. Tips: you can add ice to it. 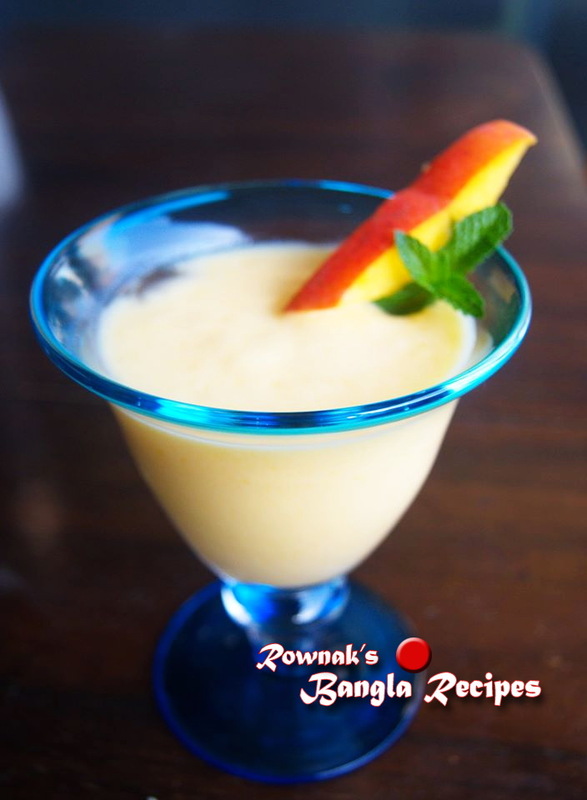 Rownak loves to cook bangladeshi food and share her bengali recipes on her cooking blog. Rownak is determined to introduce all the authentic bangladeshi cuisine to the world and let everyone realise what they were missing out! She is based on sunny Queensland (Gold Coast) in Australia. Rownak writes for a number of bangladeshi cooking blog. Rownak Jahan was born In Bangladesh, currently living in Gold Coast, Queensland Australia. Love to cook, read and learn new recipes, talk about food and teach cooking. She blogs at www.banglarecipes.com.au and also guest blog at many cooking blogs for couple of years. She loves the vastness of Bangladeshi cooking and wants to introduce Bangladeshi great traditional food culture to the world. Hope you enjoy her blog and please come back soon as we are adding new recipes every week and you can consider subscriber to our blog so she can deliver the new recipes strait to your inbox. Please Join Rownak's Facebook Page for all the latest updates and don't forget to join her on Twitter.